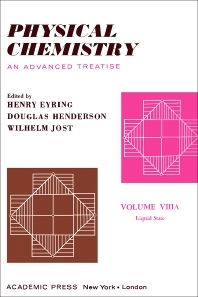 Physical Chemistry: An Advanced Treatise: Liquid State, Volume VIIIA, deals with simple liquids because the theory is most developed for these liquids. The purpose of this treatise is to present a comprehensive treatment of physical chemistry for advanced students and investigators in a reasonably small number of volumes. An attempt has been made to include all important topics in physical chemistry together with borderline subjects which are of particular interest and importance. The book contains six chapters and begins with an introduction to intermolecular pair potential-energy functions, the principle of corresponding states, and the equation of state for dense liquids. It then discusses the static and dynamic structure of liquids, followed by separate chapters on the four main techniques in the theory of liquids: simulation studies, integral equation methods, lattice theories, and perturbation theories.